As a long time SS owner, I thought I had a pretty good feeling for what Ducati is up to. They keep things similar to keep the costs down and try not to change much. Getting the 916 and having exposure to the 996 reminded me that things do change over time. Seeing newer product offerings post-TPG, has been eye opening. Ducati four valvers are at the forefront of their technology, with their foundation and heritage in racing. 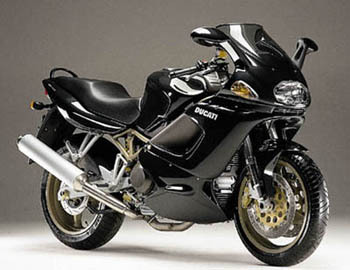 The ST4 reflects the recent trend with Ducati in using "916" sytle forks and wheels. They can be found in adjustable and non-adjustable trim on SSs and Monsters. While the displacement of 916cc makes everyone think they simply dropped in the good old 916 mill, that's not quite true. It is likely that the bottom end is similar to other Ducatis. The ST4 has different heads than the 916 or 996. It does use the common intake valve cover gasket and the SPS/996 exhaust cover gasket, along with the same rocker arms as other 4V motors. The ST4's exhaust cam appears to be positioned lower in the head than other 4V motors. This isn't found on the 996 or SPSs. The ST4 uses different "intermediate" or "rocker shaft" covers than other 4V motors and their belts are 2 teeth shorter, too, with 93. I wonder if this is from the "996RS" that has seen racing at the world scene.